Why use a molded cable assembly? A molded cable assembly might just be the perfect solution for equipment that is used in harsher environments. The success of a custom cable assembly often relies on its ability to withstand environmental conditions. Harsh conditions can include areas where there are extreme temperatures, or fluids are present that could damage the conductors. The cable assembly’s termination point may need to be durable enough to withstand vibration or continual flexing without failing. These are among the many issues that can be addressed by working with a cable manufacturer to design a custom molded cable assembly. Strain Relief for Connectors & Enclosure Exit Points – These are points where connectors are attached to cables or even reinforce a section of cable that must pass through a housing or enclosure. 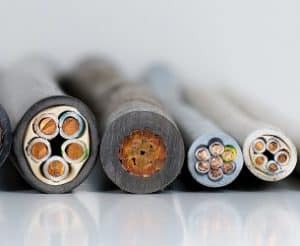 Cable Breakouts – Also called “Y” or “J” junctions, these are the point where a conductor or conductors leave the main cable. Cable Stops – An anchor point that the cable assembly passes through. Seals & Glands – Seals and glands are used to provide additional protection to the end of a cable assembly that attaches to the equipment. During the design phase, we can determine the hardness or softness of each material to create the most effective molded cable assembly solution for your application. The process to create a molded cable assembly with an injection molding machine is fairly straightforward. The machine is fitted with a mold that has been selected or created to match your specifications. The appropriate resin is added to the machine, where it is mixed with any colorants. The machine heats the resin and forces it into the mold. As the resin cools, it takes on the properties of the mold, and you have a molded cable assembly that looks and functions the way your want. Meridian Cable maintains an inventory of more than 5,000 molds, which allows us to design a cable assembly that is not only durable, but matched perfectly to your specifications. In additions to the variety of molds, we are also able to further customize your molded cable assembly conductor sizes and colors, stranding sizes, conductor insulations, fillers, wraps and shields, and jacketing materials. We can also incorporate standard cable types and UL certified wire and cable where appropriate. Get in touch to find out how we can help you make a better cable assembly for your equipment.